The surprise reunion between Megadeth frontman Dave Mustaine and the band's original bassist Dave Ellefson lends credence to the old cliché that time heals all wounds. But the reconciliation has just as much to do with circumstance as it does with time. When better to introduce Ellefson back into the Megadeth camp than on the band's 'Rust in Peace' 20th anniversary tour, on which they will play that album -- arguably their finest -- in its entirety? There was something intangible about Megadeth circa 1990 -- a magical blend of toughness, attitude, confidence and competence hasn't been duplicated by any of the band's other lineups. Of course, much of that had to do with the experience Mustaine and Ellefson gained and the musical growth they experienced since the two formed Megadeth in 1983, after Mustaine got kicked out of Metallica. Together, they produced a complex ripping, rhythmic core that was tighter than a clenched fist no matter how many hairpin twists and turns it took along its path. Mustaine and Ellefson anchored Megadeth over eight albums through various lineups, musical eras and personal obstacles. Then, in 2002, after falling asleep on his arm and suffering severe nerve damage that left him unable to play, Mustaine dissolved the band. When Megadeth announced their big 'Rust in Peace' tour in late January, it seemed certain that Mustaine would be playing the shows with Lomenzo, guitarist Chris Broderick and drummer Shawn Drover -- the same lineup that created 2009's crushing 'Engame.' 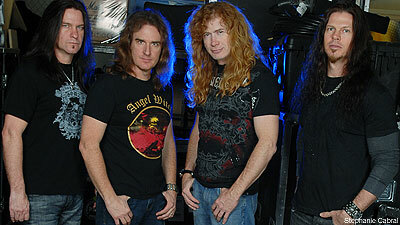 Then, on Feb. 8, Megadeth announced that Ellefson was back in the fold. Two days later, Noisecreep talked with Mustaine about reuniting with his old friend, the power of forgiveness, the departure of Lomenzo and the future of Megadeth. A lot of people thought Hell would freeze over before you played with Dave Ellefson again. How did you two bury the hatchet? When I became a Christian, my life really changed. Unlike a lot of people who say that they're Christian and really are hypoChristians, I'm not a guy that goes around, tells people how to live their life and then lives a double life behind closed doors. So, when I was forgiven I realized I needed to forgive. We had that incident with the lawsuit, and I forgave Dave for that. Several years ago when I went out to Phoenix on a business trip, I asked him if we could go out to dinner. He said, "Yeah." And we sat down at California Pizza Kitchen and had some food and talked a little bit. I told him, "I still love you." And he said, "I love you, too." And I put that behind me, because he's a little brother to me. So I'm looking at this as an opportunity to do the right thing for Dave and show him that I am a good leader and we are a great band, and we do belong playing together. Are there any lingering animosities? No, I can't stay mad at him. He's one of my best friends. Sometimes we do things in the heat of the moment. And trust me, I have done more things that were wrong that affected him than anything that he did to affect me. And again, like I said, I was forgiven, so I needed to forgive. And I wanted to really, really do what I say I'm gonna do. I mean, if anybody needed to change their life you know I did, man. I was going down a very bad path. And people make fun of me a lot right now and it still doesn't feel good, but I don't care. I'm a much happier person when I think about who I used to be and now what I am. And just by the way that I'm trying to live my life differently right now, I've gotten my best friend back and we're back to being one of the greatest bands in the world. What triggered your decision to ask him to rejoin? We were at the NAMM show, and Dean [guitars] had a party and asked if I would play, and I never do those things. So I said, "Well, I'll think about it," and then I went home, because I wanted to surprise them by coming back later. But everybody thought I wasn't gonna play, so they all kind of f---ed off. And once I did say, "Oh, yeah, I'm playing," they were scrambling around going, "Oh, my God, what are we gonna do now?" So I kind of shot myself in the foot with that one. We couldn't find [bassist] James [LoMenzo] or [guitarist] Chris [Broderick], and we were trying to find a bass player. James finally showed up, but my guitar tech approached David Ellefson, and he said yeah, he would love to do it. So that really opened the door. And since I had still looked at Dave with respect and appreciation for what he'd done for me and Megadeth and our fans all around the world, and I still had tremendous respect for his talent, it made the decision pretty easy. So a couple days ago I asked him to come back. Now, I know a lot of haters are gonna say, "How could [Ellefson] do that?" But anybody that really sees how hard I'm trying to live my life differently right now -- and I'm really trying hard -- this is just another one of the little things that you get. It's a perk for me to have one of my best friends back. The timing is perfect, with the 'Rust in Peace' anniversary tour and American Carnage coming up. Well, we're taking it one day at a time, and I hope Dave will commit to all of that. So far, we know the 'Rust in Peace' dates are confirmed. Dave is a very talented person, and I'd like to have him here permanently, but everything is in his hands. A lot of people were really excited when we announced that we were going to be playing 'Rust in Peace' in its entirety. But there are also a lot of a--holes out there that like to talk bad about me and don't think I can play that record anymore, and it's funny. I think about that, and I can only laugh. Oh, man. If you heard rehearsal the other day you would have died. It was just like right back in 1990 when we were on fire. And Dave is playing better than I ever remember him playing. He must have been woodshedding for the past eight years like nobody's business, because he was playing effortlessly and he was smiling the whole time. I kept looking at him and flipping my head towards Chris as if to say [to Dave], "Look at this dude over here." Because Chris plays [ex-guitarist] Marty Friedman's solos exactly like the record. And even Marty, God bless the little fighter, but after a while, even he got away from the solos. That kind of happens over time if you don't keep listening to it. But Chris practices 13 hours a day, so he does these solos note for freaking note, and it was just like sitting in Los Angeles back at the end of the '80s writing this record. The energy, the fun, the camaraderie. And I know there's a lot of stuff I need to prove to Dave that I'm not gonna make any bad decisions like I did back in the past when I was a junkie. So, the future remains a big question mark, but right now I'm a very happy question mark. Had you heard the music Dave released with F5? No, I didn't. I remember one time looking online, and I clicked on a band and I heard it and it was terrible. It turned out it wasn't his band, but I didn't know there was more than one F5. I just did that one time in the very beginning and then I thought, "You know what? You're doing this for the wrong reasons because you're looking up to see what he's doing and you're not doing it from a loving place." And I think now it would be real easy for me to listen to what he's done in the past, because we're partners again and I've matured quite a lot in the process. Was James Lomenzo getting ready to leave Megadeth when you asked Ellefson to join? James had given us several years of faithful quality service in the bass and backup vocal position, and when this presented itself, it was hard to make the decision to tell him that we were going to do what was right for all of us, because I care so much about James. From a business point of view, Dave's my bassist. Always has been, always will be. Everybody that's been in the bass position for me, they've been brothers and I love them for it, but it's Dave's gig. With James, he's a super-talented guy, he's a wonderful person and I know he's gonna do great at whatever he does next. He's played with some of the greatest players in the world -- excluding me. You look at his repertoire with Ozzy and Zakk Wylde, and what he did with David Lee Roth and White Lion. Those guys were enormous back in the day. So James has had a very illustrious career, and I don't think by any means the world has seen the last of James. And frankly, if I have any side projects coming up in the future, I want to be able to call up James and say, "You know what, dude? I need killer bass player with a great sense of humor to come do a couple of bass parts for me. Are you game?" And have him not say, "F--- you." Was he understanding about the decision or was he hurt? Well, I can't tell how he feels, but I believe he understood, and I know that he's gonna benefit from the records that are gonna be sold from the catalog. I think a lot of people are scratching their heads right now, thinking, "What's up with this Mustaine guy? We would never have believed he would ever do anything like this." And I think a lot of people that hated me because me and Dave parted, maybe they're gonna scratch their heads, too, and say, "We need to revisit this thing." And maybe they'll go back and look at the catalog. But one thing I do know is that interest in Megadeth just ratcheted up several degrees, and I like it. I'm glad Dave's here. It's a great time for him to be here. I missed him for a long time, and we got a lot of great things on the horizon, and I couldn't think of a better person to share it with.